Ostheimer have been hand crafting fine wooden toys for more than 50 years. They have a very high reputation for traditional wooden toys of the highest quality and are appreciated around the world. The figures are produced and finished individually in Germany. The quality of their pieces are fantastic. Each item is designed to be handed down from generation to generation. 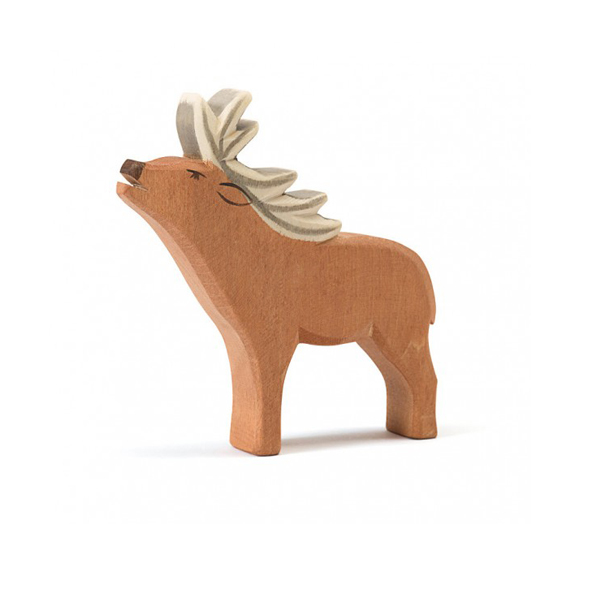 Ostheimer wooden figures are produced exclusively from high quality native hardwood, maple and elm. Slight differences in colour and slight deviations in the structure of the grain are not defects, but instead contribute to the special charm and uniqueness of Ostheimer figures. The design and the colour is based on the awareness that the children must still be able to feel and experience the wood. The figures are hand traced onto planed wood using templates. They are then sawn out and carefully sanded to achieve the typical soft edged form of Ostheimer figures. Colour is applied by hand with up to six consecutive coats. The transparent colours non-toxic, water-soluble stains which do not hide the natural surface of the wood. Warning! Not suitable for children under 36 months. Choking hazard! Contains small parts.